today we're hanging out with family down in portland, so i thought i'd just quickly post a recap of the one festive thing we've done so far this year. you see, i haven't really shown off too many festive pictures yet because well, we haven't done much of anything festive. p-ray hasn't even been to the pumpkin patch this year... yeah, mommy fail. oops. thank goodness for good friends who call you up & say "hey, come carve pumpkins with us!" and when i'm all like, "we don't have pumpkins yet..." they're all like "that's ok, we have some for you" and then i'm all like, "ok... are you sure?" and then they're all like, "yeah & by the way, we have egg nog & pumpkin pie too." and i'm all like, "sold. we're on our way." end scene. that's pretty much how it went down. don't you worry though. today is scheduled to be a fun filled day of festive festivities involving cider mills, petting zoos, costumes, candy handing-out-ing, candy eating, & more picture taking than you can shake a stick at. and believe you me, i can shake a stick at a lot of picture... taking. i will redeem myself as a mother today. oh yes, i will. care to spare a couple clicks? pretty sure that'd make you the coolest person in my book. ever. evvveerrrr. Oh I am a complete Mom fail this season. We went to a Halloween baby play date (pics to come) yesterday, which was AWESOME. But that's about it. No pumpkin carving or pumpkin patches, no trick-o-treatin', and yes... we even missed our own ward halloween party. Ha ha. Ah well. Hopefully Bennett will forgive me one day! Have fun in Portland and I can't wait to see all your pics!! That looks like so much fun! Have fun today! Have fun with all the pumpkin/Halloween stuff. Hopefully Parker enjoys the cider mill and the animals... that was always my favorite when I was a tot. I wouldn't even know where to find a pumpkin patch. How fun! Glad you got to carve pumpkins. This was our first year and Dustyn's 3rd Halloween. lol! 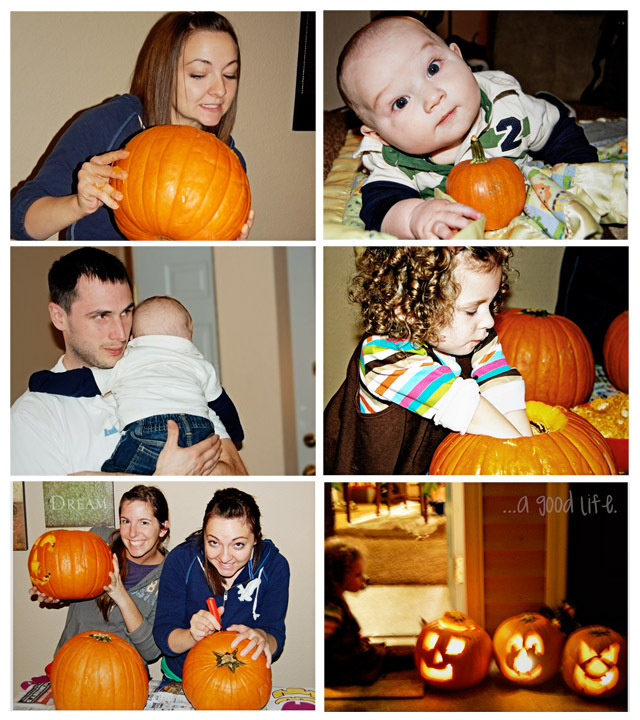 Impressive pumpkin carving...can't wait to hewar about all your activities! yeah, i sucked this year in the pumpkin department. i bought two pumpkins thinking i'd totally carve them, and then... nothing. we didn't do it. why?! i'm sill tempted to carve them even though it's november 2nd. maybe i'll do a thanksgiving theme pumpkin?